Praising sunshine 350 days of the year, Palm Springs is your go-to vacay destination no matter what time of year you’re planning to escape. At the base of the San Jacinto range of Coachella Valley, the picture-perfect mountain backdrop collabs effortlessly with palm tree lined streets to swiftly send your mood soaring towards the chilled end of the scale. Whilst we’re sure that’s all the invitation you’ll need to fill your days with cocktail fuelled pool lazing, hold up because there are plenty more ways to lose 48 hours in this Californian desert oasis. The quickest route to Palm Springs is typically by air, but if you wanna save a few dollars, book yourself a seat on LA based transfer service, Tesloop. Think modern Tesla SUVs, a ‘pilot’ with personality, affordable fixed fares, on-board snacks, Wi-Fi, and the sleep-at-night comfort knowing you’ve done your part to save the planet. It’s a win on so many levels – you heard it here first! Dive stomach-first into the swing of Palm Springs with a pit stop at local fave, Cheeky’s. Serving up inventive drool-inducing meals, you’ll lose a few minutes in the front door queue, but it’s a price you’ll gladly pay for the best breakfast in town. Order the bacon flight and don’t look back, this is the stuff holiday fantasies are made of. 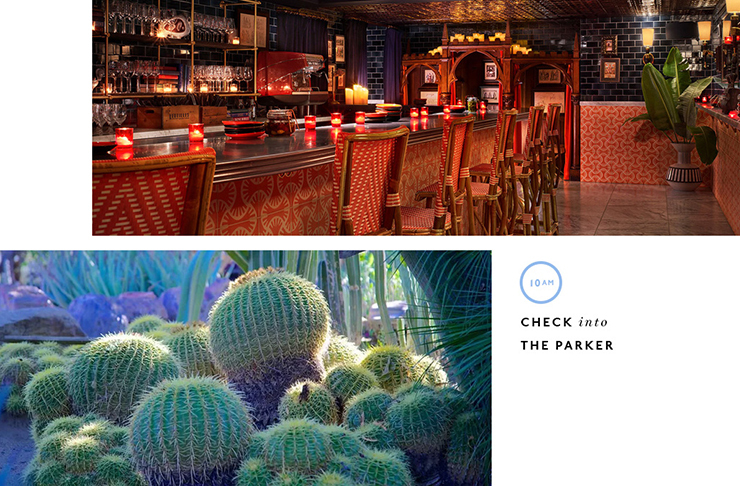 Check into The Parker and you’ll be checking into 13 lushly planted acres of grounds to enjoy. A fire pit, tennis courts, pétanque court, two saline pools – just a few of the perks included in your reservation. Swing past the lemonade stand and pick up a bike, it’s time for a mid-century modern archi-tour. You’ll be exercising all the heart-eyes, and your legs, as you catch kerbside glimpses of a time gone by with Kaufmann Desert House, Frank’s Sinatra’s Twin Palms Estate, and #thatpinkdoor. Since you’re in the neighbourhood, pop into Moorten Botanical Garden and Cactarium. No guilt should be felt for the onslaught of Insta pics caused by the 3,000 species of cactus and desert-plants that live here. Keep an eye out for the sideways-growing palm, a result of a 1950s lightning strike. Also, maybe check the weather before your visit (annually there are 15 days with weather unaccounted for). 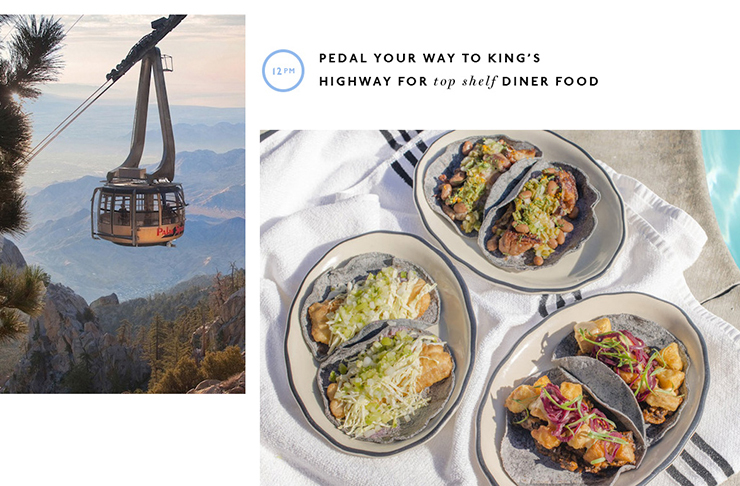 All that marvelling at plant-life will have you borderline hangry by midday, so pedal your way to King’s Highway for top shelf diner food. That’s right, FANCY diner food. A former Denny’s Restaurant, the folks at ACE Hotel refurbed the venue into the modern-day glory it is today and threw in an award-winning chef for good measure. Wipe the saliva from your chin as you administer hanger relief via boho-styled heirloom produce. Following your last bite, take a tour le pool where you may or may not collapse into a food coma (hint; you will). With lunch outta the way, Uber to Palm Springs Aerial Tramway, the world’s largest rotating tram car. Tourist trap? Maybe, but we wouldn’t mention it if we didn’t think it was worth a squiz. Ascend two-and-a-half miles into the alpine wilderness of Chino Canyon where temperatures at the peak often drop as much as 30 degrees. To quote your ma, take a coat, it’s gonna get chilly up there peeps! Vacay life takes a boozy turn as afternoon vibes call for frosés by Parker’s Gene Autry pool. Linger a little before glamming up for happy hour at Truss and Twine where well-curated charcuterie boards are washed down with the hottest drinks list goin’ around town. When you feel it’s time to balance your liquid to food ratio, cross the street for dinner at Birba. Brought to you by the same folks behind Cheeky’s, these guys churn out serious Italian fare with a side of sass. Chow down on a ‘Birba’ pizza topped with prosciutto, honey and chilli oil; simplicity never tasted so fine. Rise and literally shine with a pamper sesh at Palm Springs Yacht Club. Deservedly its own destination within the sprawling grounds of the Parker estate, PSYC remains the one place no guest ever chooses to leave. With a dress code of white cotton terry robes and slippers, surrender to a facial, wrap, massage, or reveal your toots for a bout of reflexology. This is the exact point you’ll be dialling reception to extend your stay. That catalyst you’ll need to drift away from Palm Springs Yacht Club comes in the form of Workshop Kitchen and Bar. A reg on the evening scene, Workshop opens for brunch ONLY once a week, so with that in mind you already know it’s gonna be a pleaser. Local roasters, Stumptown, have your caffeine hit sorted whilst the farm-to-table menu deals with that appetite of yours. Because we care about your wellbeing, we’re giving you a chance to undo those 10 AM calories with a marathon shop through Cabazon Outlet mall. TBH you will lose yourself in this place, it is HUGE! All your fave brands are here, so get to work on burning those cals and a mighty hole in your wallet. You’re at Cabazon, after all, you can always buy a new one. 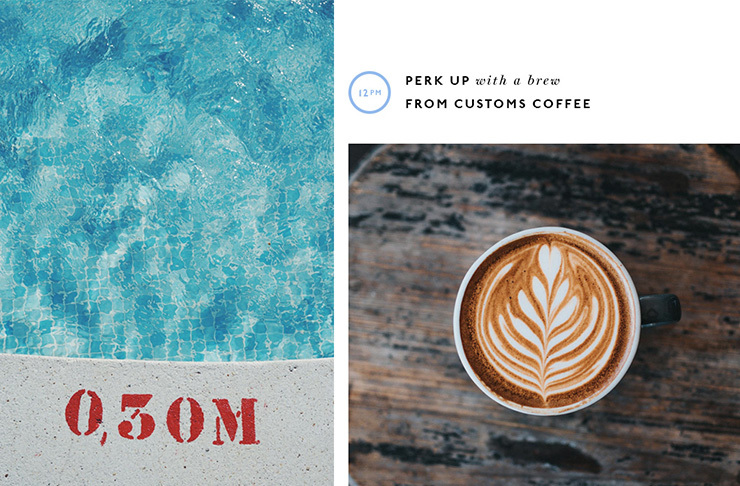 Perk up with a brew from Customs Coffee before snapping up a rental car en route to Joshua Tree National Park. If you’ve been hiding beneath a rock over the past year, this is the cactus-dotted landscape filling your Insta-feed. Embrace a new level of awe as you spend the afternoon climbing dramatic rock-faces and wandering endless desert trails before settling down for sunset. 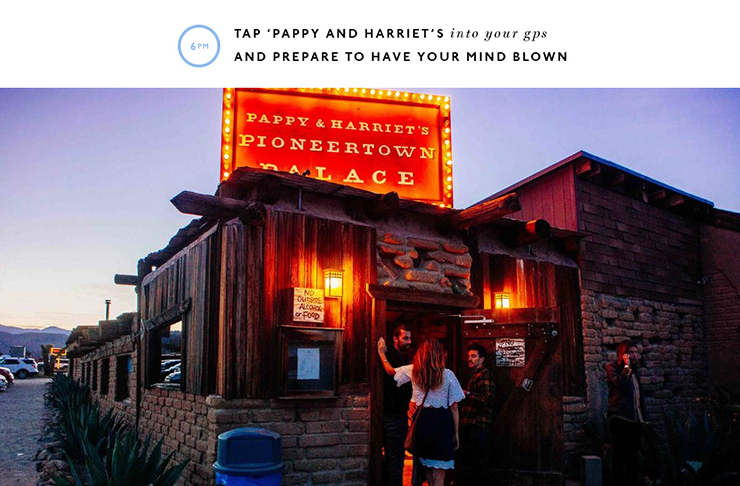 Okay, you’re done climbing boulders so tap ‘Pappy and Harriet’s into your GPS and prepare to have your mind blown. That’s right, it’s that almost-secret roadhouse featuring some of the coolest local and heavyweight musical talent within the Pioneertown slot of Cali. Grab yourself a ‘merican meal from the outdoor BBQ and you’ll agree this place nails anyone’s definition of a good time. As you arrive back to The Parker bypass the bar for one final nightcap by the fire as you reminisce the weekend whilst perusing your schedule to check when you’re next free for a return trip. That’s right, you WILL be back. Best time to visit: Any time. With less than 5 inches of annual rainfall, sunshine is 99% guaranteed (don’t quote our maths on this). Don’t forget to pack: Your Mister Zimi swimsuit and most flamboyant sunnies. Fill unexpected gaps in your itinerary: Snuggled into a hammock of Parker estate with a good book. If your trip is extended an extra day: Roadtrip to Salvation Mountain. Hypothetically, if more coffee is required: Run, don’t walk, to Ernest Coffee. What exactly is ‘pétanque’? In short, a French version of lawn bowls. Got the travel bug? Check out how to spend 48 Hours In NYC!